Petal Talk: Want Variety? 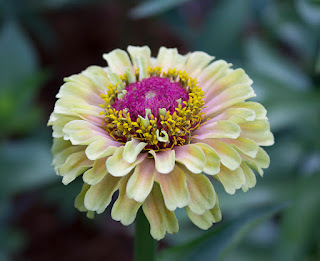 Plant Zinnias! Red Heart' in a bouquet. I can't imagine a garden without Zinnias. 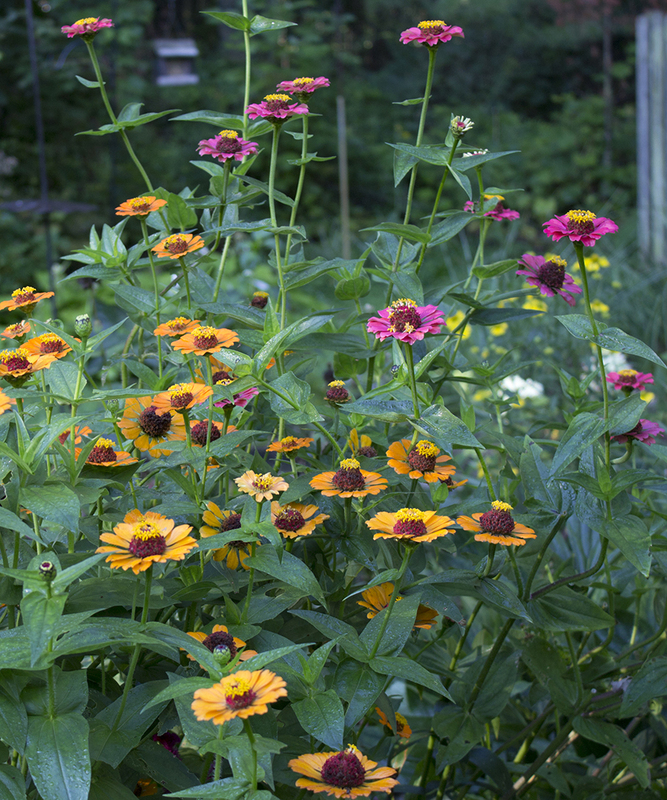 They're so easy to start from seed, either in April indoors or after the soil has warmed in late May. This year, I started two "batches," the first, called 'Queen Lime Red Heart' sown in early April, and the second, 'Raggedy Ann Mix' started in a container outdoors on May 25. The first group, 'Queen Lime Red Heart', began to bloom just six weeks after sowing. The Raggedy Ann mix is showing several flower buds, and looks like it also will bloom six weeks after seeds were planted. 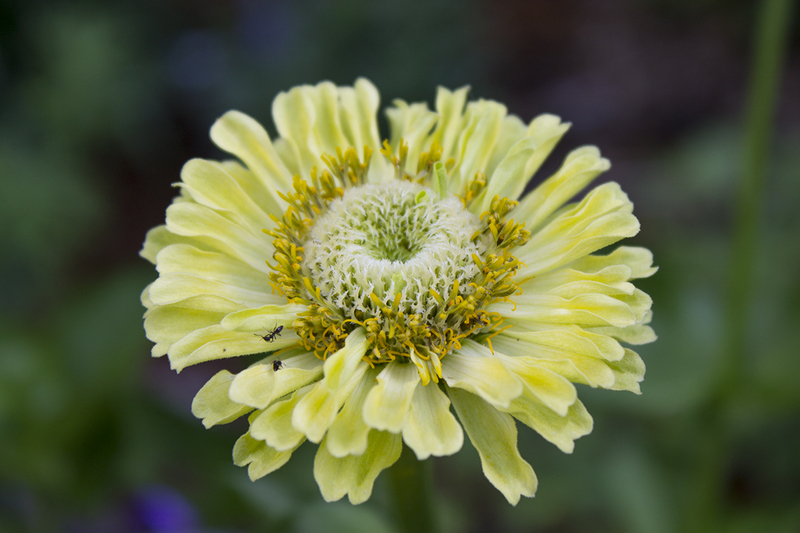 Zinnia 'Queen Lime Red Heart' is a new one for me. I bought seed from Baker Creek Heirloom Seeds based on their great photo and description. 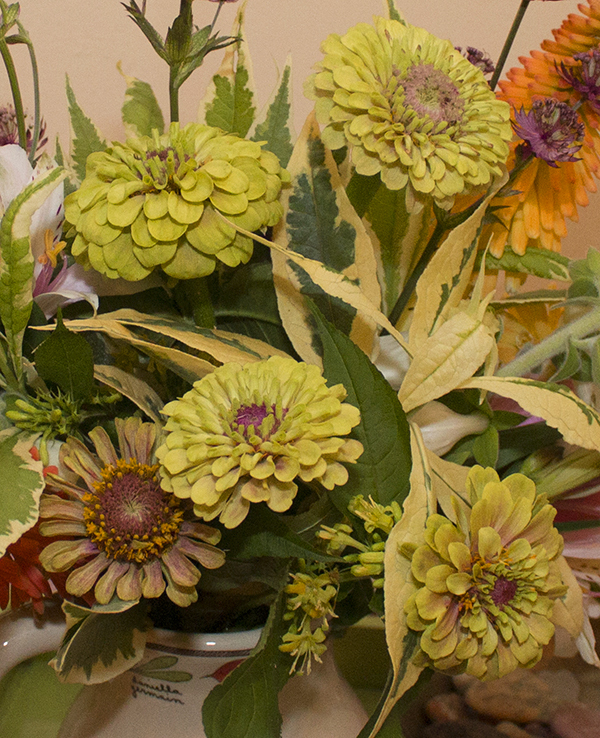 The photo shows the variability in color from bright yellow to dusty pink, all with a red center. 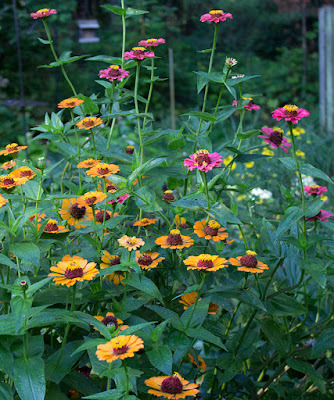 I like variability in plants--at least in those that I can plant a dozen or so. That way, I can appreciate and compare the differences. If I only planted one, or even three, it wouldn't be as interesting. Although it was touch and go for awhile when I transplanted the seedlings to their ultimate homes in the ground, I ended up with exactly 12 plants divided into four different growing areas in the garden. Some have been blooming for a few weeks while others haven't opened their buds yet. I'm really enjoying the different types of flowers that are blooming from one small packet of seed. 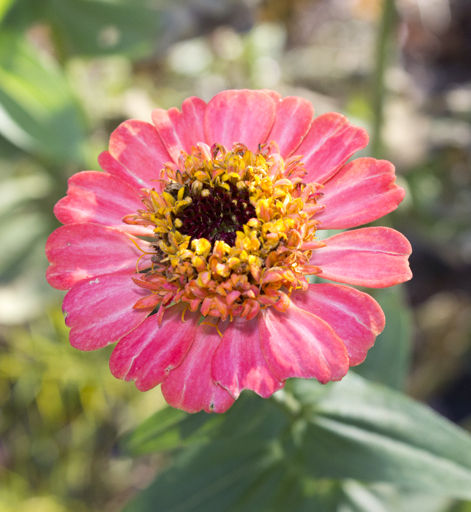 Some have more red than others on the petals; some are singles while most are doubles. One plant insists on putting out solid green flowers. didn't quite turn out as expected. The Queen Lime Red Heart cultivar isn't the only Zinnia I've grown that offers variety. When I found a photo of a Scabiosa-flowered Zinnia a few years ago, I had to try it. 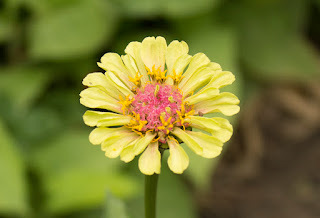 It was an adorable little flower with a raised tuft of petals in the center of each bloom. The resulting flowers were cute, but didn't really look much like the photo that coaxed me into growing them. I learned later that only a percentage of blossoms from this type of mix turns out to be crested, and since I only ended up with about four plants, it was somewhat of a disappointment. I'll try them again next year, this time with the promising Candy Mix. 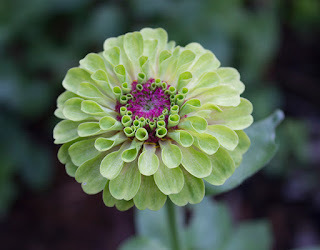 I guess the bottom line on Zinnias is that you have to commit to growing more than six plants per season. It took me awhile to learn this lesson, as I'm always so gung-ho to grow as many different plants as I can squeeze into my garden, that I've have to limit duplication. When it comes to growing Zinnias, especially the color mixtures, more is better. Which is why I'm growing another 20 plants of Raggedy Ann Mix. I can't wait to see how they turn out. 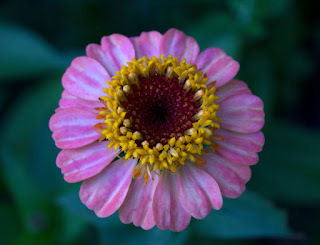 Zinnias are fabulous plants. Love everyone of them.